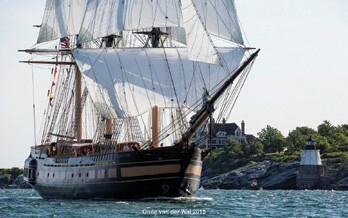 Oliver Hazard Perry Rhode Island (OHPRI) is seeking to hire licensed deckhands for its brand new 200-foot SSV Oliver Hazard Perry, which is based in Newport, RI and scheduled to sail throughout New England this summer. The Tall Ship is the first full-rigged ocean-going ship to be built in the USA in over 100 years and requires that crew applying hold an Able Seaman license or Masters license (any tonnage) with auxiliary sail endorsement or international equivalent. Wurzbacher pointed out that SSV Oliver Hazard Perry has everything crews love about Tall Ships, but none of the things they don’t. “There’s a 130-foot rig to climb and seven miles of line to haul at the start of the day, but there are hot showers and climate controlled spacious accommodations to retreat to at the end of the day.” Other amenities include an environmental science lab, state-of-the art classroom technology, wheelchair accessibility, and climate-controlled learning spaces. Positions are full-time and live-aboard. (Room and board provided.) To be paid, candidates must be U.S. citizens or permanent residents. For more information, email jess@ohpri.org.